Our government’s finances are broken. How do we compare with our peers? Summary: Our government’s finances grow worse each year. Comparisons with the financial condition of our peers show our peril. We’re on the clock. Only smart, rapid, cohesive action can save our Regime. These articles are worth reading in full, plus the additional ones listed at the end. Here are the highlights. Money in motion: what nations are improving? are going down? 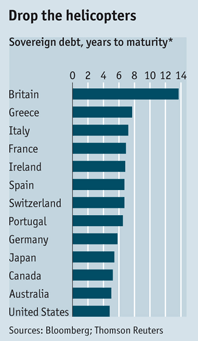 From “More debt rankings“, by Buttonwood, blog of The Economist, 2 February 2010. This compares net debt, excluding intragovernment loans (accounting tricks, like our social security trust fund). The longer the average maturity, the less risk from rising interest rates — and the easier the soft default of inflating away debt. On the other hand, short debt is much cheaper than long debt. This is from “The inflation solution“, The Economist, 11 March 2010 — “The merits of inflation as a solution to the rich world’s problems are easily overstated.” At 55 months (as of the first quarter), the US debt is dangerously short. The Treasury plans to length the maturity to 80 months over the next few years. These graphs pull show the the trajectory of government finances during the next few years. 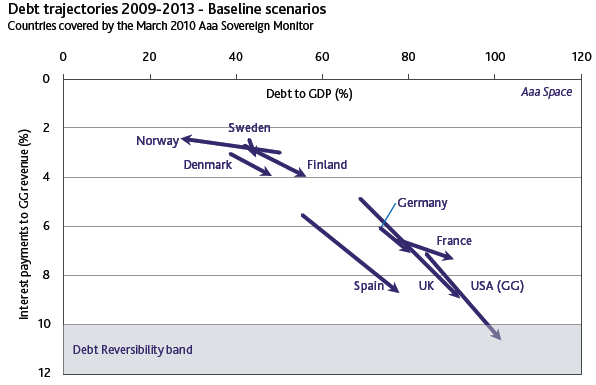 From Moody’s Aaa Sovereign Monitor, March 2010. This graph — although complex — shows the grim picture . In this graph bad means moving down and right. How odd that we’re in such worse shape than those profligate socialist hellholes Sweden, Denmark, and Finland! The USA line includes the States; the picture is worse looking only at the Federal government. Moody’s analysts also show our government’s vulnerability to rising interest rates (resulting from short average maturity of the debt), as seen in the following graphs. The x-axis numbers look far worse looking only at the core government, excluding revenue and expenditures for Social Security and Medicare. They have their own problems, now running in the red. With some bad luck, debt expense could hit 30% of core government revenues in 2013. The day is late, and drastic steps have become necessary. Triage is the only solution. Renegotiate the debt as soon as possible, as our position will likely weaken over time. Extend maturities. There will be a price to be paid for this. Use government funds as needed to maintain the economy until it recovers, but spend only to mitigate the suffering and invest in projects that provide an economic return for the overall economy (capturing as much of that as possible for the government, through ownership or loans). As the economy recovers, cut government spending as fast and deeply as possible. Share the pain, put the greatest burdens on those best able to bear them. Foreign wars with vague benefits to our national security will become unaffordable luxuries. Arrange long-term financing for steps #1 and #2 with our foreign creditors.